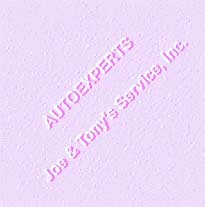 JOE & TONY'S SERVICE INC. Does your car need a costly repair job? How do you know whether or not you are paying the right price? Most people can only hope they're being charged fairly. Now you can get a second opinion on repair costs! The professionals at Autoexpert can keep you from overpaying for automotive repairs.